I am a newbie. As in I have only cast a two handed rod a few times for Steelhead on the lower Manistee River. Completely foreign and looking to establish at least some credibility in the Spey Casting World of Fly Rods. I have decided this was a perfect opportunity to ask friends who are two handed experts and share this experience with others who may be in the same boat as myself. Some of the terminology is intimidating- OPST, LASAR, MOW, Skagit, a huge variety of lengthy and weighted rods which are to be paired with even more variety of leaders and weighed line from yet even more line manufacturers. Spey Rods and Switch Rodshave evolved and even come together in a streamlined category- either a Long Two handed rod(Spey)- over 12 feet, or short- less than 12 feet- two handed rod(Switch). To understand the rod and it’s capabilities, we can look at the origin in Scotland on the River Spey, where Atlantic Salmon were often targeted species, yet tall banks along the river thwarted traditional backcasts. The 13-14′ long rod has been in use in Scottish rivers for nearly a century, providing a common goal- to get a fly out in a wide river without backcast. The Spey approach keeps the line on the water and the fly in the targeted zone longer than a traditional line that would rise and pull a salmon fly out of the desired depth. The use of two-Handed rods has spread, from the Pacific Northwest for Steelhead where it has obvious benefits, to break-lines in the east coast for Stripers and for myself in northern Michigan where freshwater Steelhead migrate in many of our rivers that connect to the Great Lakes. The dilemma is similar, my rivers may be smaller, but deep cut clay/shale banks or densely wooded cedar/pine forests don’t allow for great casting and the speed of rivers only allows my fly a momentary glimpse in the prime target zone of these silver bullets. So I asked my friend, Spey casting Guru Jimmy Chang what direction should I be looking for specific rivers northern Michigan has to offer. An eleven to twelve foot 7-8 weight rod would be best suited for rivers I am searching out steelhead. “The Head should be 2.5X the length of the rod, if it’s too short, you will be ripping the anchor, too long is difficult for the beginner to manage.” says Chang. I have had the opportunity to cast with Jimmy on casting ponds at shows and at SA HQ. Getting expert advice first hand is paramount in cutting the learning curve. Spey Casting Clinics are often held by local fly shops and annually at Henning Park on the Muskegon River sponsored by Great Lakes Fly Fishing Shop. A good way to test a variety of rod lengths and styles along with a variety of lines. Next, I asked Phil Cook from Angling Consultant Servicesfor some of his advice. “When doing your research on which rod to purchase, you will find what is referred to as a “grain window,” for a given stick. using 10′ and shorter sink tips on this setup. The second would be what is considered more of a “traditional,” Skagit set up, 12’6″ to 14′ moderately stiff rod, mono (44# again), a standard Skagit head (23-26′), paired with 12′ sink tips and fly based on water speed and depth. His best advice- “The longer your rod, head, tip, and tippet combination you feel comfortable with, the bigger your D-Loop. The bigger your D-Loop, the more power you can generate in your cast. There also an absolute length ceiling for each rod, usually 3.5x the rod length for head, tip, and tippet rig. 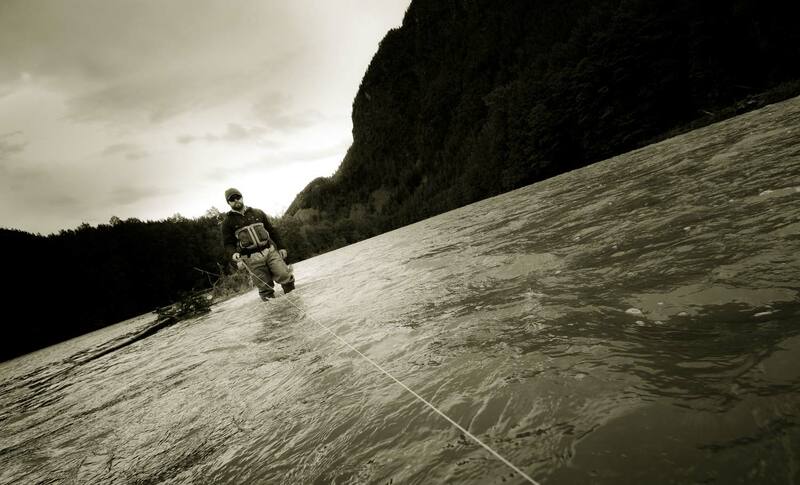 Want to learn to spey cast and catch some steelhead in the process? There’s no better place better than the G&G Deschutes Steelhead Camp. Get the details here or shoot me an email at hookups@ginkandgasoline.com to reserve a spot. This entry was posted in Fly Fishing Tips & Technique, Spey Casting, Steelhead, The Hot Ticket and tagged from the Pacific Northwest for Steelhead where it has obvious benefits, The use of two-Handed rods has spread, to break-lines in the east coast for Stripers and for myself in northern Michigan where freshwater Steelhead migrate in many of our rivers that connect to the Great Lakes. by Louis Cahill. Bookmark the permalink.